Need a healthy holiday appetizer? 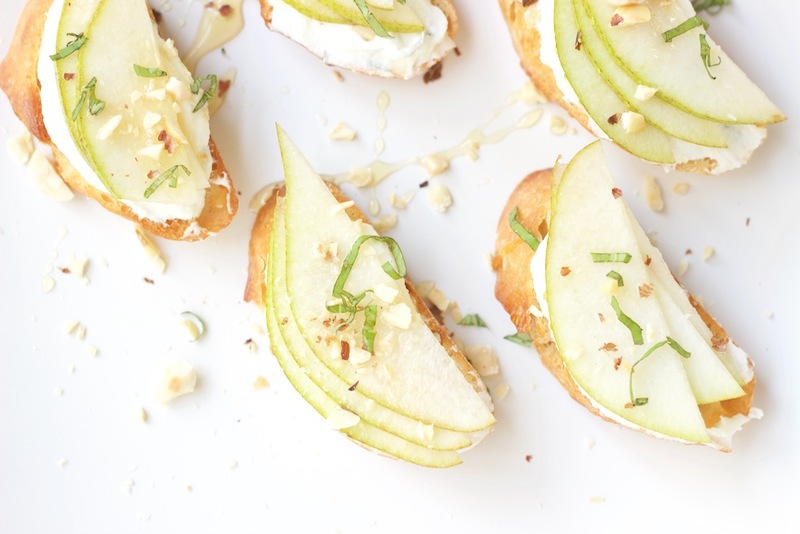 This sweet and savory Pear Crostini with Honey Hazelnut Goat Cheese is an easy yet elegant appetizer that’s perfect for a party or brunch! If you’re like me, you can’t believe we are in the middle of the holidays and the end of the year is almost here. I’m working to finish the year strong, prepare for a busy first quarter of 2017 and importantly spend quality time with my family and friends. Of course, this all involves food! One of my favorite things about the holidays is the variety of appetizers and mini desserts that pop up. From parties to brunch, there are so many little bites to try – some more indulgent that others. To balance out the cookies and other treats, I like to add something a bit healthier to the table. 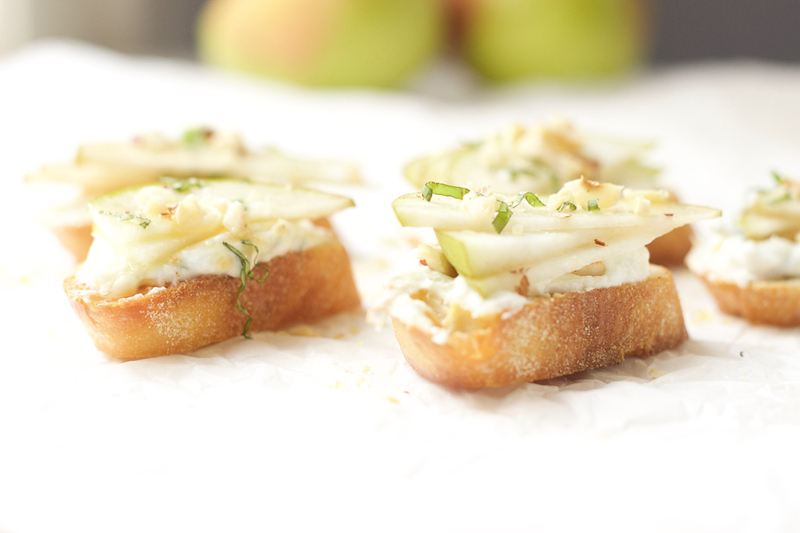 This pear crostini does the trick! 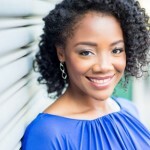 Many people worry about weight gain during this time of the year. I don’t. Chances are you’ll put on an extra 1-2 pounds between Thanksgiving and New Year’s Day – not the 10 pound rumor floating around the internet. In fact, you can enjoy everything about the holidays without gaining a pound. Work with what’s in season. Seasonal fruits and vegetables deliver the best flavor and nutrition during this cooler months. Apples often steal the spotlight this time of year but there are other options. Pears are sweet, fragrant and juicy this time of year. I used Comice pears, which deliver true pear flavor with a crisp texture. Pears pair well with sharp cheddar cheese and work in a variety of dishes from salads to pear crisps and crumbles. Keep it colorful. Greens, beets, vibrant winter squash, pomegranates, grapes, cranberries, and other fruits add a punch of color and festivity to the simplest recipes. 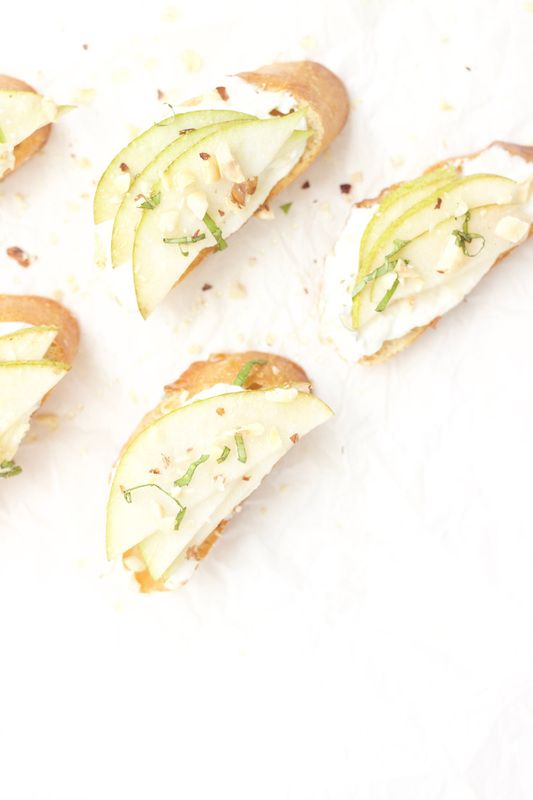 When working with a blank canvas (hello there pale pear crostini! ), add fresh herbs like tarragon, rosemary or thyme to play up the color. Indulge a little. There’s no reason to avoid the foods you love. Just eat a little less. Find a few good swaps. In this recipe, I used goat cheese. Goat cheese is creamy, flavorful and decadent but lower in calories than many spreads. It’s the perfect complement to sweet, fresh fruit. Bread is off-limits to some but not me. These little toasts get a pass. Try a whole grain baguette and slice it as slim as you’d like! BONUS: Be flexible and have fun. Add a drizzle of honey, caramel or a balsamic glaze to make your dish come alive and nurture your inner artist in the process. These last few weeks of the year can also be a stressful time for some. If you need to put together a quick, better for you appetizer, that’s another reason to try this recipe. It takes less than 15 minutes from start to finish. What are your quick and healthy holiday recipes? I’d love to hear about them in the comments or over on Instagram. Cheers to a healthy and happy holiday! 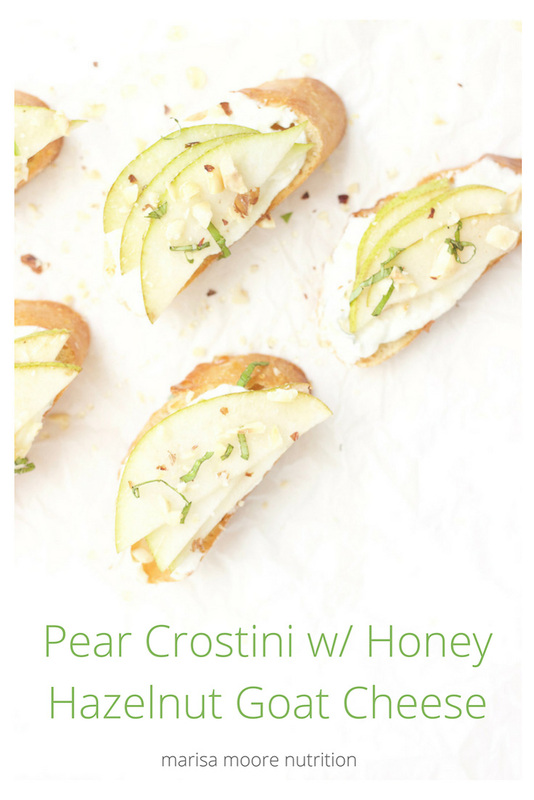 This sweet and savory pear crostini makes an easy yet elegant appetizer for your holiday party! Place baguette slices on a baking sheet in a single layer. Brush each side with olive oil and season with salt and pepper. Bake 7- 10 minutes, until lightly toasted. Remove and let cool. In a small bowl, stir softened goat cheese, honey, hazelnuts and tarragon just until blended. Spread the goat cheese mixture evenly onto the crostini. Top with pear slices. Arrange the crostini on a serving platter. Drizzle lightly with honey then sprinkle with chopped hazelnuts and tarragon. Serve. Such a great app - easy to make, tasty, and indulgent but not dangerous. 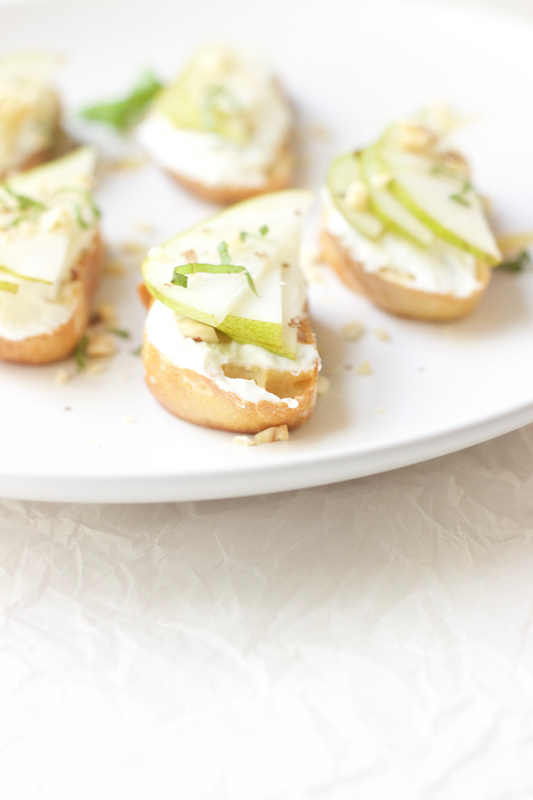 Pears & goats cheese make such a delicious pairing, too. These look DELICIOUS! The perfect holiday appetizer! This is an intersection combination of flavors I would love to try. Wow, this is perfect; I enjoy pears and goat cheese as a pairing. This appetizer is a perfect little bite for a party or to enjoy as a snack.